Until the 1940s, there were no standardized size designations for home or industrial needles; each manufacturer chose the sizing system they liked best and there were over 40 systems of sizing in use. In the 40s and 50s, the sizes were standardized, although a few manufacturers choose to use the sizing methods they used in the past. For the vast majority of needles, a metric size designation, NM ("number metric") began use throughout the world. The NM sizing is the diameter of the needle in hundredths of a millimeter measured above the scarf or the short groove of the blade of the needle - the area above the point and eye that goes through the fabric. For example, an NM 70 needle has a blade diameter of .70 millimeters; a needle designated NM 130 has a blade diameter of 1.3 millimeters. NM sizing generally ranges from 35 to 200, in other words, .35 to 2 millimeters thick. The most widely used needles are the 50, 60, 70, 80, 90 and 100 sizes, in other words, half a millimeter to a millimeter thick. The difficulty arises when sewing machine manufacturers use designations outside of the NM standard. For example, Singer products are widely used, but they choose their own designations. For example, a Singer .70 millimeter blade (which would be called a 70 in NM nomenclature) is called a 10. Since Singer's products are so widely known, this size will often be referred to as 70/10. 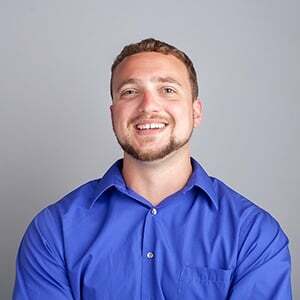 Conversion Charts will show you the other sizing designations that you may see. Rule of thumb, if the number you see stamped is between 35 and 200, that is probably the NM number. Where is the number located? Most manufacturers stamp the size on the shank of the needle that is inserted into the machine. The needle type and needle system are also often stamped here. 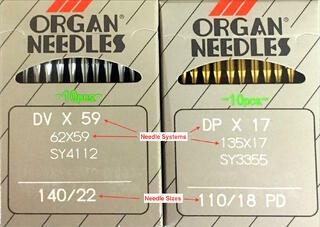 The needle sizes and systems can also be found on the packaging like these Organ and Schmetz needle packages below. What is a needle system? two groups of numbers with an X separating them. some are denoted by letters followed by numbers. some systems do not follow either format, (e.g. 1000H or C100R). some systems have more than one nomenclature as well (see photo). check with the manufacturer of the machine in need of needles to be sure of the system it uses. check the nameplate. Some machines have the needle system stamped into the nameplate/info plate. look to see if there are spare needles. Often a sewing machine will come with a packet of spare needles, making it easy to reference the correct system. refer to the operating manual as another possible source for the right needle information. Needle manufacturers are excellent resources for needle information, as are thread and yarn experts. If you need help finding the correct needle or thread for your sewing machine, please let us know!